Ferrari has now officially gone public. Fiat Chrysler Automobiles (FCA), which owned a 90 per cent stake in the supercar manufacturing company, floated 9 per cent of the Ferrari's shares at the New York Stock Exchange on October 21. FCA's initial price for the offering was $52 (Rs 3,389) per share, with Ferrari valued at $10 billion (Rs 651 crore). But as the day progressed, the prices for the share peaked at $60.97 (Rs 3,955.09), 17 per cent over the initial public offering, finally closing at $55. The company value for Ferrari grew to $11 billion by the end of the share trading. Over the last few months, Ferrari had been running road shows and sending out invitations to retail investors and Ferrari owners for the impending sale of its shares. The shares listed under the stock ticker that read 'RACE' raised $893 million for Fiat Chrysler Automobiles NV, funds that FCA will perhaps employ towards reviving ailing brands under its wing like Alfa Romeo, Jeep, Chrysler, Ram and Fiat. The trading of the shares was 'flagged off' in Ferrari fashion with eight models from the supercar maker, including the current Formula One car and the new 488 GTB model, lined up outside the stock exchange. 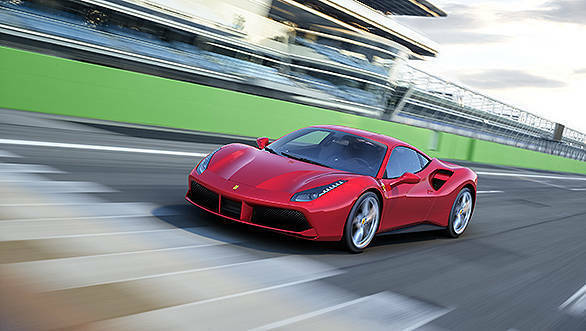 Fiat CEO, Sergio Marchionne and Ferrari chief executive Amedeo Felisa set the ball rolling by ringing the opening bell. Nine per cent of the company is now traded in the market while one per cent has been reserved for underwriters. Fiat Chrysler Automobiles will retain 80 per cent of its share in Ferrari and will distribute more Ferrari stock to shareholders next year. 10 per cent of the Ferrari shares will continue to be held by the Ferrari family.